Boun Khao Phansa, the beginning of the 3 month Buddhist lent. Buddhist Lent is a period of three lunar months during the rainy season when monks are required to remain in one particular place or wat (temple). Monks and novices have to swear themselves to live in the same place. They can’t stay in the other places over night. During this period, monks are practicing meditation more than usual. 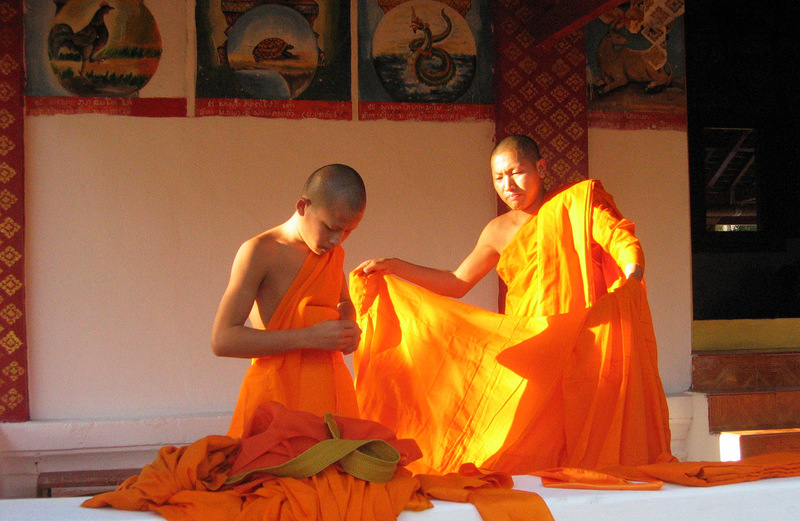 Every full moon day, monks have to gather in one temple to recite “Phadhimoka” or 227 rules of monk. Khao Phansa Day is on the first day after the full moon of the eighth lunar month and marks the beginning of the three-month rainy season. The tradition of Buddhist Lent or the annual three-month rains retreat known in Lao as "Phansa". Khao Phansa means to remain in one place during the rainy season. There are two words “Khao and Phansa” Khao denotes “enter” Phansa represents a time of renewed spiritual vigor and Khao Phansa festival is a major Buddhism merit-making festival. The day before Khao Phansa Day is Asalha Puja Day. The day falls on the full moon of the eighth lunar month. This day is also very important in Buddhism as the day of the Triple Gems happened such as: Buddha, Dhamma, and Shangha, which the day of the Lord Buddha preached his first sermon to the five disciples such as: Anyakondanya, Padhiya, Vabbha, Mahanama, and Atsasi. The Sermon is “Dhammachakkabbhavattana sutta or (The wheels of life). The main sermon is to refrain sexual pleasure (kammasuka), and mortification (Atta kilanuyoka), and practice in the middle way (Makkamakka padhipadha), the day is usually celebrated by merit making, listening to a monk’s sermon, and joining a candle light procession during the night. During Khao Phunsa period monks should not venture out or spend the night in any other places except in cases of extreme emergency and, even then, their time away must not exceed seven consecutive nights. The Buddha prohibited monks to travel this period because it is rainy season and hard for monks to travel in wet season and it is period of plant fertilizing. There is a story of monks travel in this period and damaged local’s plantation, so this event reached to the Buddha therefore, the Buddha didn’t allow monks to wonder to other places during the rainy season. They have to find a proper place or temple to stay and this is a time for contemplation and meditation. The monk meditates more, studies more and teaches more. For Buddhist Phansa is also customarily the season for temporary ordinations. Young men enter the monkhood for spiritual training, to gain merit for themselves and their parents, it is believed that a man who has been a monk will lead their parents to the heaven because monk is a sign of purify and happiness. For this reason, most of them are prefer to become a monk in this season. They have to spend most of their time to learn, and practicing and train themselves under guidance a venerable. Different places have different tradition and custom, according to my tradition, a boy should volunteer to stay at the temple to learn Dhamma, chant with the monks, and help work at the temple such as: clean monastery area, wash dishes, and serve monk. During the middle of Buddhist Lent of full moon of September, some province in Laos especially in Luangprabang is celebration of Boat Racing festival. The celebration starts afternoon at 1pm to 5pm. First round of the racing is women which dressed black and white to open the competition. After that the game begins to compete. The people stand alongside the River to cheer their fan of boat and there is also music near River. Every one enjoyed and spent money for drinks. 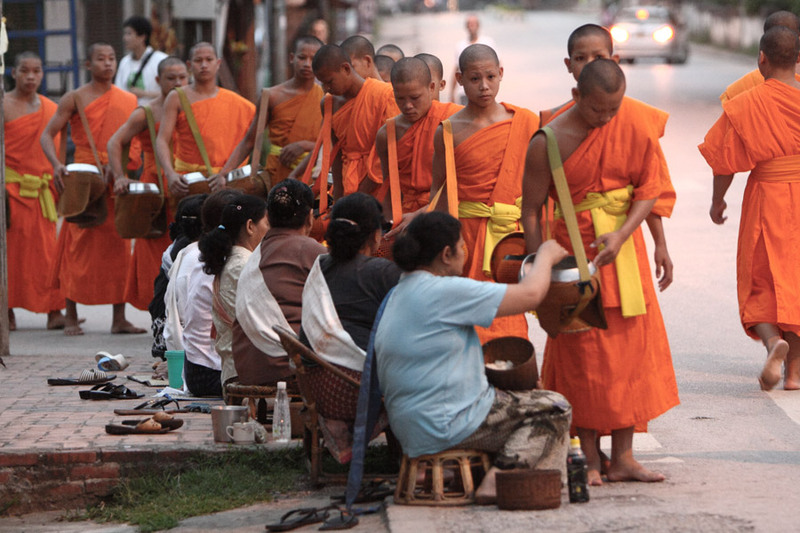 The festival is hosted every year in Luangprabang. It was took place of “Nam Khan River” to race the boat which the period of higher River but in dry season the River is lower.